We had decided early in the week that this would be the day we would schedule a special dinner cruise with Captain Alex of Islescapes Gourmet Yachting, and we had some leftovers from previous nights out to get us through lunch, so we just read, watched some TV and spent some time lounging by the pool. We went to find Capt. Alex’s boat around 4 p.m. and that was too early, so we walked around a bit to fill the time. His boat is a small cabin cruiser, 33 feet, and he normally only serves four people, although he can serve six, if need be. You order in advance from a limited but ample menu, bring your own liquor, beer or wine, and Capt. Alex and his first mate, Stelmarra, do the rest. Alex is an interesting person; his brochure lists him as “Capt. Alex, PhD,” so I had to ask him about that. It turns out that he retired from his job as a cancer researcher not too many years ago. He’s been running afternoon snorkeling and luncheon cruises and dinner cruises out of Key West for the last year and a half. We got on board with the other couple, whom we didn’t know, and first mate Stelmarra cast off the lines and we were off for the short cruise to the place where we would anchor, have dinner, and watch the sun go down. Capt. Alex furnished each couple a Shrimp Boat consisting of lightly blackened shrimp in a Thai chili sauce. My appetizer was a crabmeat Portobello mushroom layered with a savory crabmeat stuffing, four cheeses, fresh herbs and baked on the grill followed by Caesar salad, then the main course, which was a combination of mahi-mahi and grouper alfredina sauce, a white wine cream sauce with Parmesan cheese and sun dried tomatoes. Dessert was strawberries with Key Lime White Chocolate Whipped Cream. Diane chose a potato goat cheese tart appetizer, a fresh mango slices marinated in a rosemary and honey vinaigrette served over baby greens with toasted almonds and sharp white cheddar, Jamaican jerk marinated pork tenderloin, and crème brulee. 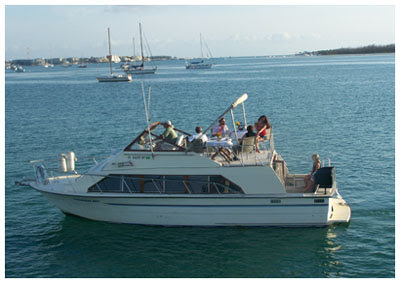 All in all, it was a very pleasant dinner, and being on the water during the sunset was great. We got back to the dock around 7 p.m., walked around downtown for a while, then headed home.